Race figures prominently in the national debate as the Republican and Democratic national conventions near, but how important this issue is to American voters varies by their race and which presidential candidates they support. Yet the treatment of racial and ethnic minorities is among the highest-ranked issues on the agenda for voters who are supporting Hillary Clinton in the general election. Fully 79% of Clinton supporters say this issue is very important to their vote. Clinton supporters rank the treatment of minorities at the same level of importance as the economy (80%), terrorism (74%) and gun policy (74%). Clinton backers are nearly twice as likely as those who support Donald Trump to say the treatment of minorities is very important to their 2016 decision (79% vs. 42%). The gap in importance placed on this issue by the two presumptive presidential candidates’ backers is among the widest across the 14 issues on the survey. By more than two-to-one, voters also are more likely to give Clinton the edge over Trump when it comes to acting on race relations as president – the widest advantage for either candidate across 12 issue areas asked about. Two-thirds (66%) think Clinton is the candidate who would do a better job dealing with race relations, while only about a quarter (26%) say Trump would do the better job. An overwhelming majority of black Americans see the treatment of racial and ethnic minorities as a key issue to their vote in 2016. Fully 82% of blacks overall say this issue is very important, and it is among the highest on this group’s 2016 agenda. Nearly three-quarters of Hispanic voters (72%) also say the treatment of racial and ethnic minorities is a very important issue to their decision in the fall. Both blacks and Hispanics are more likely than white voters to say this issue is very important to their vote, though a 56% majority of white Americans do say the same. Among whites, though, there is a substantial partisan divide in the importance of this issue in 2016. About three-quarters of white Democratic voters (78%) rate the treatment of racial and ethnic minorities as a very important issue in their 2016 vote. By contrast, white Republican voters are far less likely to say the same: 40% say it is very important to their decision. 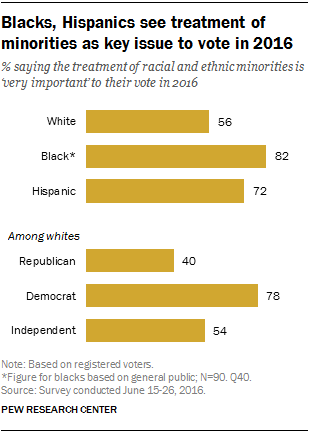 About half of independents (54%) call the treatment of minorities very important to their vote. The importance of the treatment of racial and ethnic minorities to voters’ decisions in the 2016 election mirrors attitudes about the attention race and racial issues get in the United States today. A separate Pew Research Center survey this spring finds that blacks also are about twice as likely as whites to think there is too little attention paid to racial issues in this country (58% vs. 27%). Smaller shares of black Americans think race and racial issues get too much attention in the country (22%) or that they get the right amount (17%). Among white Americans, who are less likely to find the issue very important to their vote in 2016, 41% think race is given too much attention in the U.S., and fewer (28%) say it gets paid the right amount of attention. White Republicans are especially likely to say the issue of race is paid too much attention in this country today: Roughly six-in-ten (59%) think this is the case; 11% think it’s paid too little attention, and 26% think it’s given the right amount. By comparison, about half of white Democrats (49%) think racial issues are given too little attention in the country, compared with 28% who say they are given the right amount and 21% who say they are given too much attention.